Here’s a destination to pen in for spring. Spring, because this incredible castle and its’ grounds are about to close for winter on November 4. But this is one destination you won’t want to miss visiting! 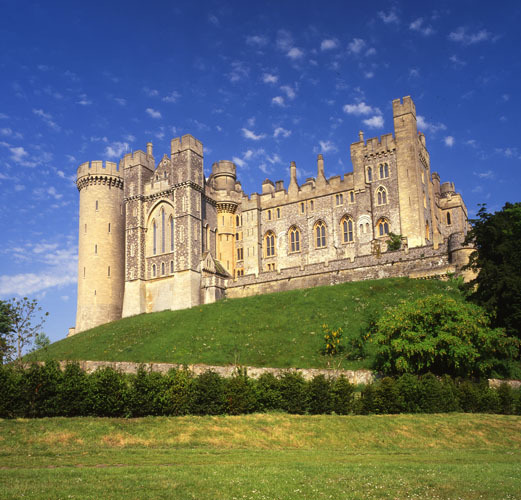 Arundel Castle began life in 1067, via Roger de Montgomery, Earl of Arundel, ‘one of William the Conqueror’s most loyal barons,’ then granted ‘a third of Susses’ for it to be constructed, ‘near the mouth of the Arun’ to protect the region from attack. 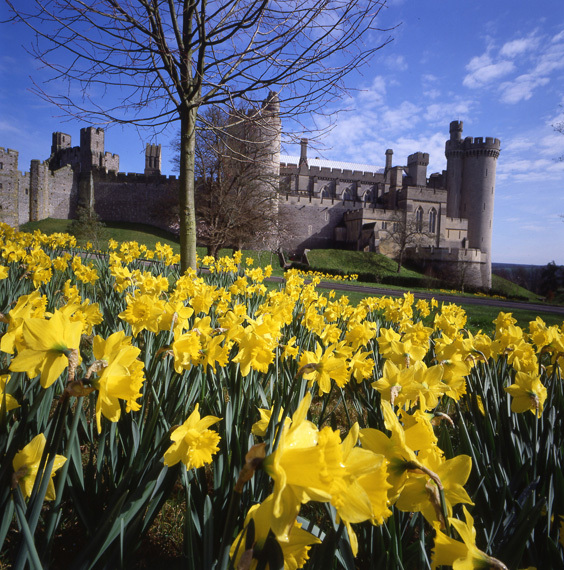 One of the longest inhabited country houses in England, Arundel Castle’s Norman keep, gatehouse, barbican and lower Bevis Tower survive. 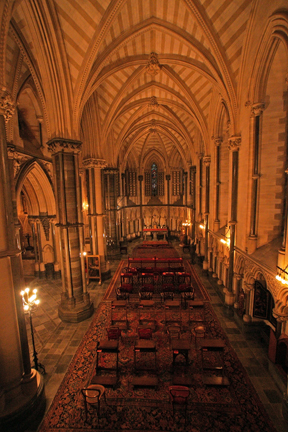 In addition, the 15th Duke’s Gothic remodelling of the castle (1870’s – ‘90’s) have made it ‘one of the great works of Victorian England.’ You may think you’ve yet to see this sublime Castle, but you probably already have, as it’s been the setting for many a historical re-enactment, live and for TV and cinema, The Young Victoria (2009), in which Arundel’s Baron’s Hall stood in for Windsor Castle’s Great Hall among them. This amazing Castle has been a family home for the Dukes of Norfolk for nearly 1,000 years! The interiors of this Castle are seemingly, unparalleled for their alluring combination of elegance and good taste, expressing affluence in a comparably, understated, aesthetically pleasing way. St. Mary’s, private Chapel inside the Castle is understandably said to have taken its’ architectural cues from dwarfing Westminster Abbey and The Angel Choir of Lincoln Cathedral. Given the high calibre of its’ colourful stained glass and fine carvings, it is, without doubt, one of the definitive examples of Victorian architecture in England, vividly reflecting on the country’s 19th Century Catholic revival. Unfortunately, a foot ailment prevented me climbing the long, winding stone staircase to and from the Norman Castle Keep, with its Dungeon, Store Rooms, Civil War Room and other remnants of its’ history. My partner did the honours in my stead, enjoying panoramic views in all directions. His photos hint at what was possible from those perspectives and it is, by all counts, quite spectacular! While walking along the lengthily Keep, visitors are also able to learn about some of the Castle’s former inhabitants, among them, Queen Matilda (1102 – 1167), daughter of King Henry I, who though rightful ruler by order of succession, had her throne seized by her cousin, Stephen de Blois. The Armoury, showcasing a vast collection of weaponry and protective helmets through the ages, collected by the 15th Duke, was, as one guide quipped, designed to ‘give them something to talk about after a nice Sunday lunch.’ Only four helmets survived from the days of the English Civil War. Aforementioned Baron’s Hall is without exception, the grandest room I’ve ever seen anywhere, not in terms of sumptuous furnishings, though, like the rest of the Castle, it has extraordinarily well crafted furnishings, but for its’ architecture, featuring oversized stone fireplaces and the highest vaulted ceiling imaginable. It’s difficult to cite a centre point in such a place, but larger than life paintings of James II (1633) by Sir Godfrey Kneller and King Charles I (1600) by Sir Anthony Van Dyck command attention! A collection of forty-five carved and painted wooden crests made for Knights of the Garter, hung in St. George’s Chapel at Windsor Castle in the Knights’ lifetimes are also on show. Former guest bedroom, The Marshall Room, named for Earl Marshall, whose duty it is to arrange State Funerals, Opening of Parliament, Coronations and the like, was the site of much interest, with its’ 19th Century red velvet covered billiards table, large enough to nearly fill the entire room. Such tables were found in two thirds of English country houses 1835 – 70. Snooker was invented in 1875. The Library, formerly the Long Gallery similarly reflects the high levels of craftsmanship evident throughout the Castle, here, via rich mahogany panelling and most outstanding, a silver encrusted Madonna icon. Photographs of the former Duke with various Popes through the years are displayed on tabletops and shelves in several rooms in the Castle. The Library with its’ lavish accoutrements is one of the best examples of the Regency era. What is a staircase if not Grand? Portraits of ancestral children, notable for their warmth and youthful character line the ascending walls leading up the distinctive Castle Bedrooms and adjoining Victorian baths, inviting for their obvious comfort and individual decoration and designs, in tasteful colours. The rooms express a myriad of botanical themes, no doubt miming the splendid gardens outside. From our doorway perspective, a glimpse of stunning views of the surrounding countryside was just visible through, oft stained glass trimmed windows over-looking the grounds. There are more portraits hanging in Arundel Castle than any other place I’ve ever been, from glass cased miniatures to larger than life paintings in massive frames and many well known artists figure among their creators, including Joshua Reynolds, Anthony van Dyck and Thomas Gainsborough. Also on show throughout the Castle, are groupings of china, armour, art, antiquities and countless other precious artefacts, from the lives and/or vast collections of its nearly 1,000 year long residents. Favourite among the many drawing rooms was The Canaletto Room, with its’ three light and airy landscapes by Canaletto himself, reflecting their gently sunny colour scheme of soft crème, Mediterranean blue, verdant green and ripe peach via its furnishing, some of which were brought from the Dukes of Norfolk 18th Century London home at St. James (now demolished). This warming room was remodelled by the Duchess of Norfolk in 1997, with the help of a contemporary designer. Cocteau’s surreal cinematic fairytale La Belle et la Bete came to mind as I peered into the rose coloured York Bedroom with its rich but tender hues, like those of a newly bloomed flower. Though to my mind, the Windsor Bedroom, with its small, sparkling chandelier, finely carved four poster bed and floral patterns was the loveliest of all, topping even the Victorian Bedroom with its’ scarlet and gold, and dainty, velvet covered steps leading to a large canopied bed. Wandering down the lengthily Castle corridors on a rainy Sunday, I was charmed and somehow, comforted to see such well preserved reminders of so many eras co-existing so happily. Victoria, Albert and their large party slept at the Castle December 1 – 4, 1846 at which time it was, a guide informed us, completely remodelled for the royal visit, with specially designed furnishing created for the bedroom they’d be sleeping in. The fact that their hosts had approximately two years notice of their impending visit helped them spread the cost. As we’d travelled to Arundel from Brighton via a meandering Sunday Coastliner bus, time did not permit us to visit the eco friendly gardens planted with beneficial insects and wildlife in mind, among them a Victorian peach house and vinery and contemporary Rose garden. We did however pause at the 14th Century Fitzalan Chapel, ancestral resting place of the Dukes of Norfolk and their ancestors, making a mental note to return to take in all we’d missed at some, hopefully not too distant date. Many exciting historically themed events, designed to inform visitors of various aspects of the Castle’s time-line in no doubt, a very entertaining fashion, take place each year. Though it sits on a hill, above the charming market town of Arundel, the Castle is really, in closer proximity to London than one would imagine, a pleasant train journey from Victoria Station away. So you’ve no excuse not to visit come spring! Ideally, a visit to Arundel Castle should begin when it opens at 10 am and last until it closes at 5 PM though whatever the time or season you visit your memories of it are destined to linger long after. Open Tuesday to Sundays inclusive, and August Mondays and Bank Holiday Mondays.